Rich and buttery shortbread cookies are crumbled, mixed with cream cheese, rolled into balls, and then dipped in white chocolate, and topped with sprinkles. They’re a no-bake treat that everyone will love. 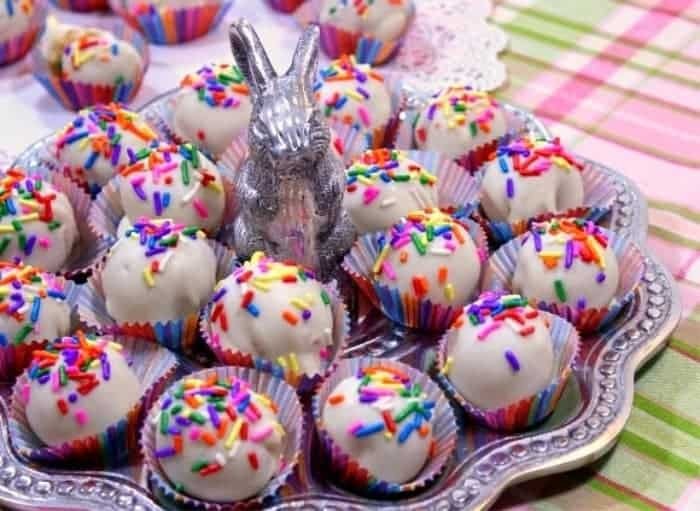 **Please Note – The printable recipe card with detailed instructions, complete ingredient measurements, and nutritional information for making No-Bake Shortbread Truffles is available near the end of this post. Is there any special equipment needed to make this recipe? You’ll notice in the video that I used a food processor to crush the cookies and to blend the crumbs and cream cheese. However, if you don’t have a food processor, a large zip-top bag and a rolling pin will work equally well to crush the cookies into crumbs and a hand mixer will work well to blend the cream cheese into the cookie crumbs. **Special Note – Just make sure the cream cheese is at room temperature as this will make the blending easier. What are some good homemade shortbread cookie recipes? Not long ago I shared the recipe (shown below) for Traditional Irish Shortbread with you, and it was those same broken shards of cookies that I used to make these shortbread cookie truffles. After all, a twofer is never a bad thing, right? 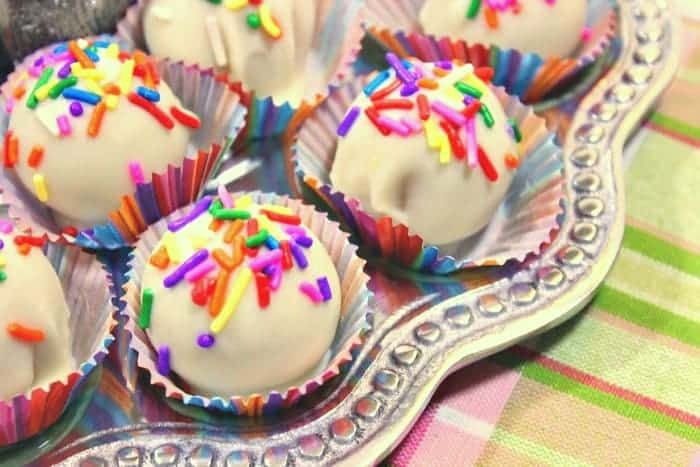 However, please know that store-bought shortbread cookies work just fine for making this recipe so if you’re not a baker, or just don’t have the time on hands to bake from scratch, please don’t let that stop you from making these delicious no-bake shortbread truffles. Your family and friends will thank you! What type of store-bought shortbread cookies are best for this recipe? The ones without the cream filling. Since you’ll be adding cream cheese to the cookie crumbs any additional filling in the cookie will alter the consistency of the balls and they won’t hold together as well. Shortbread is my favorite type of cookie. I just love the simplicity of the ingredients, and yet the richness of flavor. These shortbread cookie truffles will soon become a family favorite. Add red sprinkles to the top along with and a tiny dot of red food color to the cookie and cream cheese mixture for Valentines’ Day. 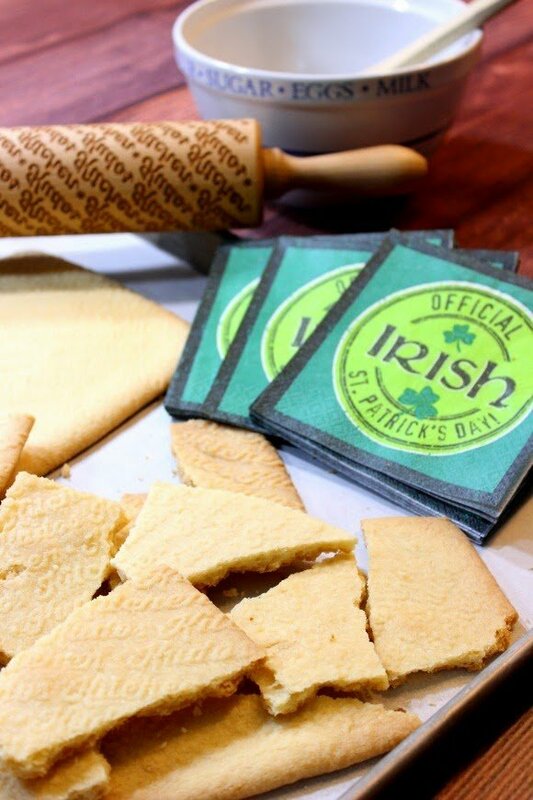 Add a ¼ teaspoon of mint extract into the cookie and cream cheese mixture along with green sprinkles on top for St. Patrick’s Day. Add red and blue sprinkles on top for Memorial Day and/or the 4th of July. Add a touch of orange food color to the cookie and cream cheese mixture, along with some orange and black sprinkles for Halloween. A touch of red or green food color to the cookie and cream cheese mixture along with some red and green sprinkles for Christmas. Add blue sprinkles on top for Hanukkah. Use your imagination. The possibilities are endless!! 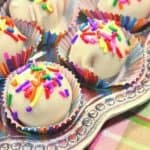 **The following affiliate links are some suggested products I’ve chosen that will aid you in the making and serving of this recipe for No-Bake Shortbread Cookie Truffles if desired. 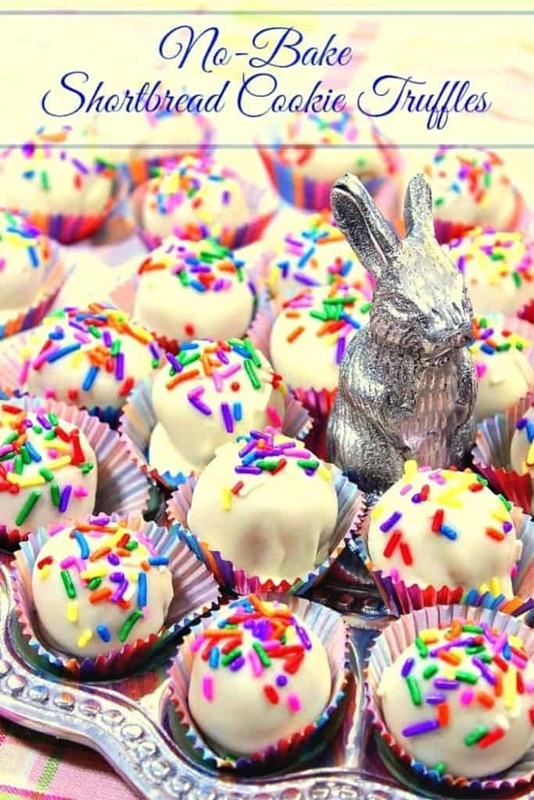 Below is the printable recipe card for today’s No-Bake Shortbread Cookie Truffles. Rich and buttery shortbread cookies are crumbled, mixed with cream cheese, rolled into balls, and then dipped in white chocolate, and topped with sprinkles. They're a no-bake treat that everyone will love. Blend the softened cream cheese and cookie crumbs until a dough forms. Roll the cookie crumb mixture into balls the size of a walnut. Set aside. Melt the chocolate chips in a microwave on low power, stirring frequently until smooth and creamy. Do NOT try and heat the chocolate fast or it will seize up and get hard. Dip the cookie balls into the melted chocolate, allowing the excess to drip off. Place the cookie truffles on a plate and immediately sprinkle with jimmies while the chocolate is still wet. I sincerely hope you’ve enjoyed today’s recipe for No-Bake Shortbread Cookie Truffles as much as I’ve enjoyed bringing it to you! These are such a fun and festive treat for birthday parties! 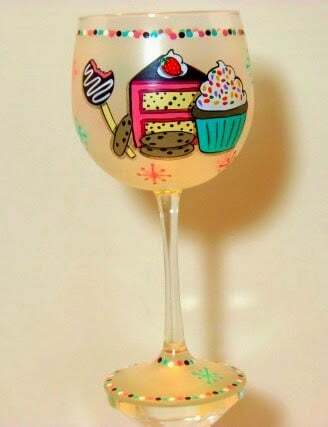 These would be fantastic for birthday parties! Great idea!! These little treats check all of my daughter’s favorite things! We are going to be making these on repeat!